7 Mar 2017. It was Alina who first mentioned Babí Lom to me. She said she’d been there, and because I like hiking I should go at some point. It took me a few days, but I eventually did realise why the name rang a bell. I’d made this list, some time in early January, where I’d listed places outside Brno I wanted to visit, and Babí Lom was top list. So, because I had 7 March off, and because I sort of needed a one-/half-day escape, and somehow the name of the place had been stuck in my head for a while, I resolved to go. It just made sense. 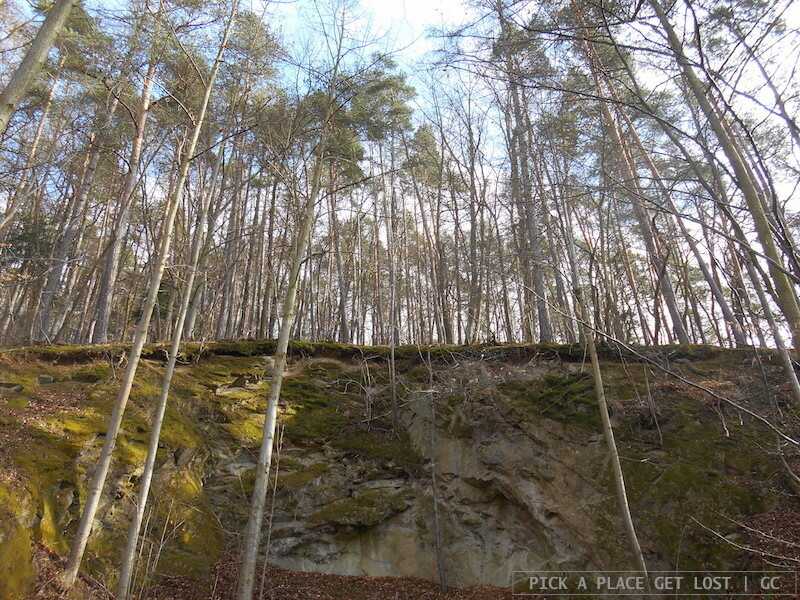 Babí Lom is not far from Lelekovice, a tiny village outside Brno, which can easily be reached by public transport. I boarded tram 1 in Mendlovo náměstí and got off at Semilasso. I crossed over to the bus 41 stop, which is literally just round the corner, and… well, waited a good 45 minutes, because the bus had. just. left. 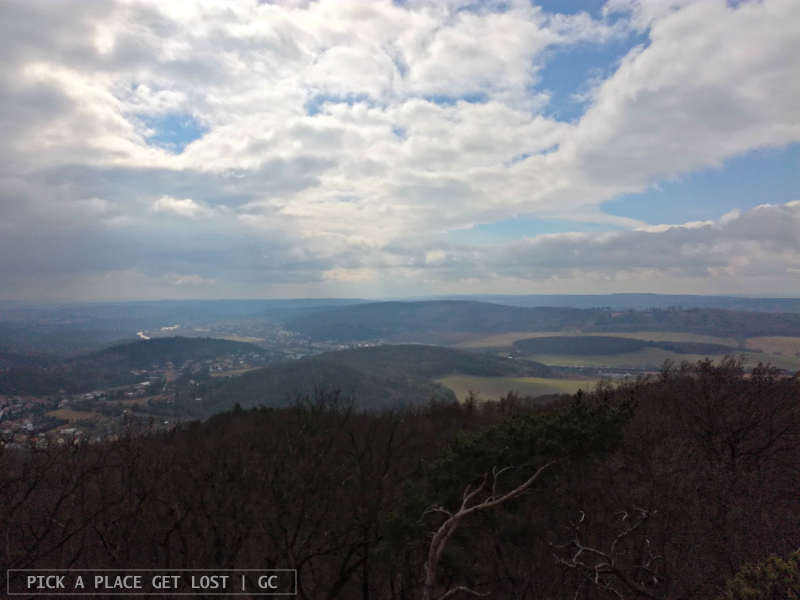 As the next bus drove out of Brno, you could easily tell you were heading to the hills. One minute you were still on Palackého třída, all surrounded by colourful shop fronts and the urban hustle and bustle, and the next the bus was driving down a quiet road flanked by grassy patches, and not a person in sight (but for the few waiting at the bus stops). Buildings also grew sparser, and block of flats were quickly replaced by detached or semi-detached houses. Some resembled the standard, stereotypical mountain hut, all wood and bare bricks, while others displayed rather bold, daring architectural styles, as if their being isolated was enough to exempt them from conforming to the standards of a more sober, nondescript cityscape. 2. Wait a second. I first glimpsed, then followed with my eyes the flat, verdant profile of the hill crest, and spotted it. Not that you could miss it: the watchtower looked like an intruder arbitrarily pinned to the very top, like a white buoy in a sea of green. The watchtower was my goal for the day. I’d read a couple of blog posts and checked out maps and websites over the previous few days, and the photos I’d come across were actually very promising. So there it was. I was fretting. And I was also suspiciously eyeing the people getting on at every stop, because I was well aware that my bus ticket didn’t cover the area I was in, and ticket inspectors in (and around, I assume) Brno may reveal themselves when you least expect it. Just please not here and not now. 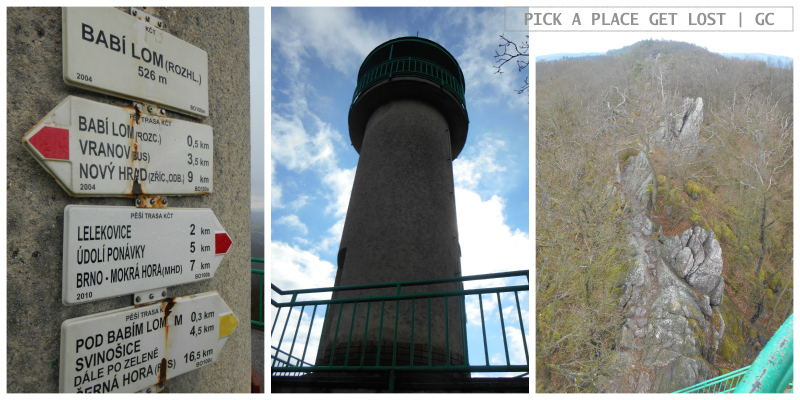 When I got off at Lelekovice náves bus stop (still with no inspectors around), it was easy to know where I should go. 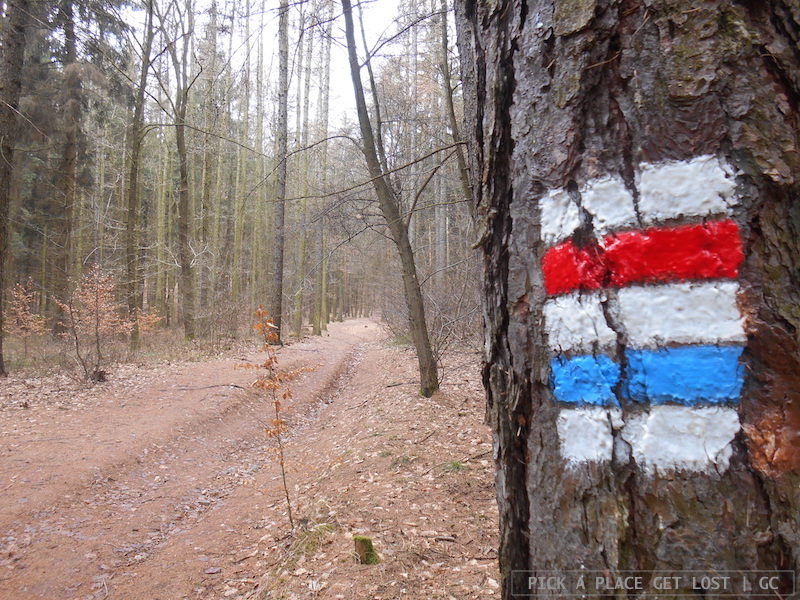 In fact, the whole of the hiking trail is uber well marked, thanks to actual signs and recurrent symbols of the individual trails you can choose from. I made a left turn to leave the main road, and delved into the woods. For the next 30 minutes (maybe it was 40, or 50, the truth is I’ve no clue how long it took) the path was super smooth. In fact, it was an actual paved road going uphill, also for cars (not that I saw any, but just to give an idea). 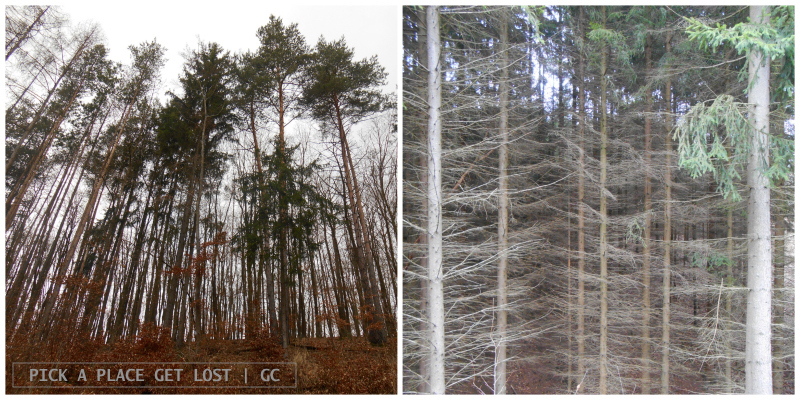 The woods surrounding it were amazing, entirely consisting of super tall, slim trees, mostly bare but for a bunch of sort-of-pine trees whose funny branches were sticking out like perfectly horizontal lines. 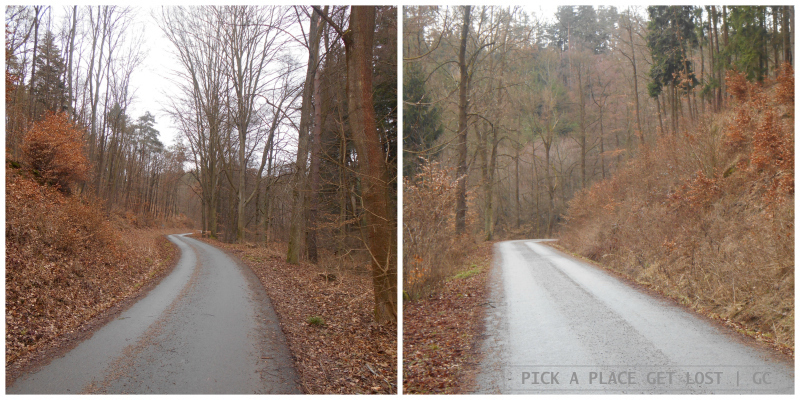 I kept going for a while, and at every twist half hoped half expected I would sort of at least see where the road led. In fact, at every bend the eye could only stretch as far as the next bend, which was only some 40 or 50 metres ahead. Seriously, Moravian weather, get a grip. I finally reached a clearing with picnic tables and a promising orderly row of signs. None of them mentioned the watchtower, but there were three or four ‘Babí Lom’ signs pointing in opposite directions. Oookay. I then spotted one that read ‘Babí Lom (rozhl. )’ and followed the ‘red tourist trail’ (‘po červené turistické značce’). I remembered that the author of the blog post I’d read also followed a red trail to reach the tower and, well, she made it there. So I thought that made for scientific enough a reason for me to pick that trail, also because it meant leaving the main road, which was something I very much wanted to do. 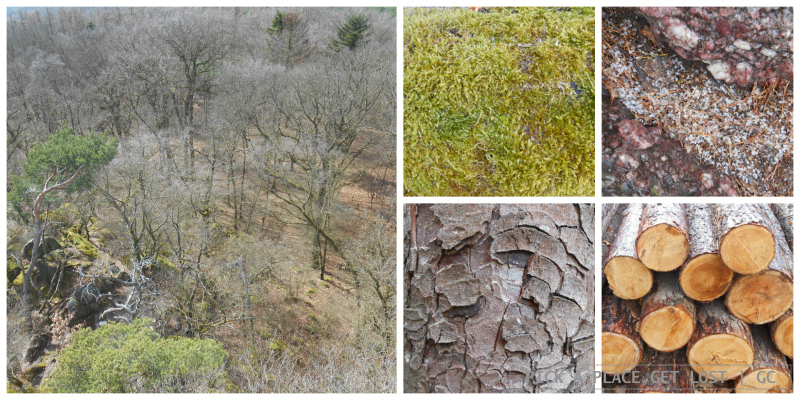 The terrain was earthy, flanked by thick woods, and surprisingly dry, though technically it had rained overnight. Within a few minutes I found myself standing at the top of the hill, which had quite a funny shape. It kind of looked like its originally roundish shape had been squashed on two opposite sides to make it oblong, and to make the hill thinner and taller. You know, like when you’re building a sand castle and you press the sides of the fortified walls to make them higher. 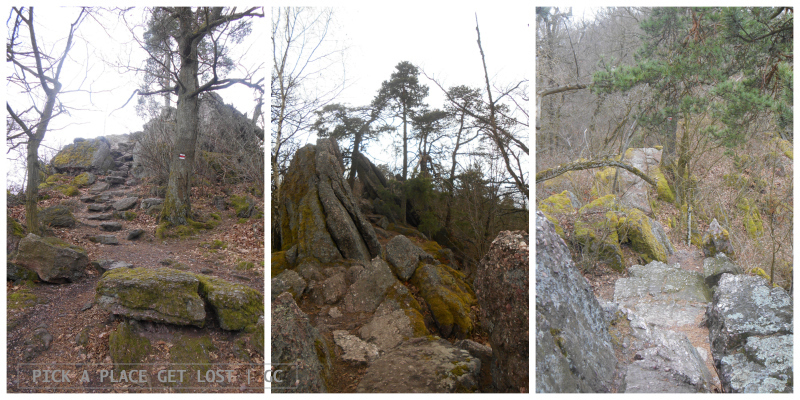 I had the rocky downhill slope right in front of me, and two trails, also rocky, running along the crest on both sides. Where to now? More signs, one of them marked ‘Watchtower’ (in English). Yes. I turned left, and followed the hill crest. It took me a while to take in the utter beauty of everything around me. 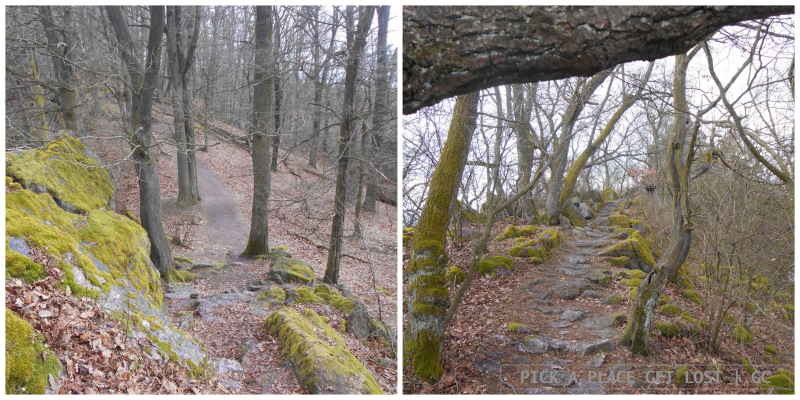 The trail along the crest was a mixture of leaf-covered earthy ground and piles of rocks, some of which were a little tricky to climb over. On my left the slope was covered by a rug of leaves so thick you could barely see the ground, and the bare trees seemed to painfully stretch their pitch black branches toward the sky. On my right I had more trees, rocks, and a sweep of hill after hill after hill stretching out in the distance. The light was mesmerising. The sky was overcast, with random showers lasting less than a minute, but the clouds cast a greyish, silver hue on everything: the leaves, the fallen trunks, and the bright, velvety moss that covered at least half of the rocks in the whole of the reserve. 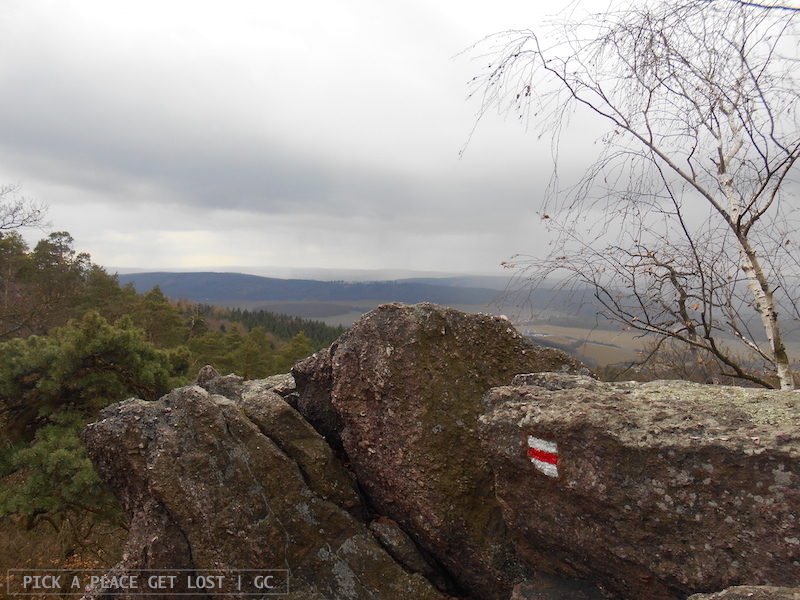 Yes, Babí Lom is a ‘přírodní rezervace’ (natural reserve), as several signs here and there in the area solemnly point out. But like, where exactly is the watchtower? Then it started hailing (seriously, hailing), and for a few minutes the perfect silence of nature was covered by the metronome-like sound of hailstones the size of mints. Even they were delicate in their drumming sound, like they feared their downward motion would cause too much noise if they pounded the rocks more heavily. 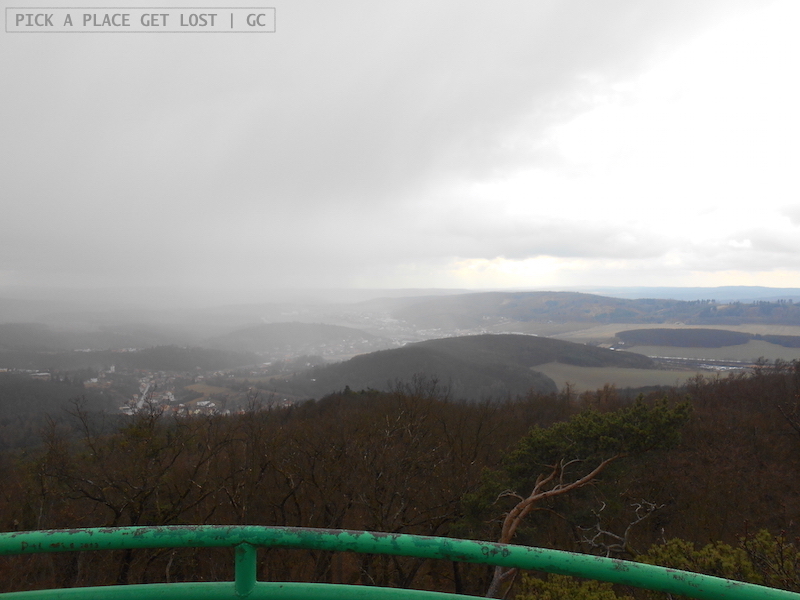 Then the hail was gone, still no watchtower in sight. I glimpsed it in the distance shortly after the zillionth shower, just when I was growing to believe it had been removed from its standing point in the previous couple of hours or so. There it is! When I reached it, I climbed the stairs to the lower outlook point, a balcony running along the roundish wall of the tower. It was spectacular. The air was chilly, and the mist partially covered the hills in the background: they seemed to literally disappear into thin air. Then I climbed the iron spiral staircase to the upper outlook point, at the very top of the tower. Okay, truth is, as soon as I got there I went straight back downstairs, because I was joined by this kid, shrieking and jumping all over the place, and then by his sisters plus mother plus aunt-or-friend-or-who-knows-who, and they were so loud and so annoying and… I’m out of here. 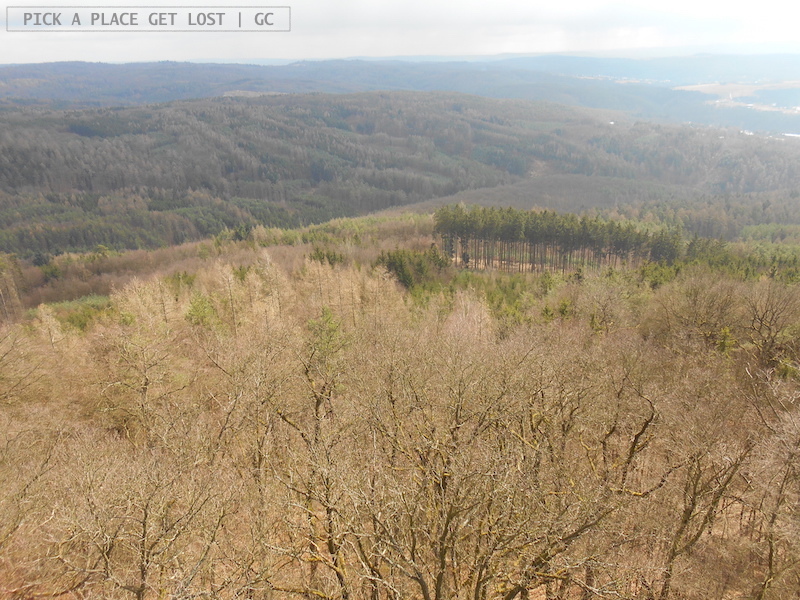 Luckily enough, they left a couple of minutes later, and got lost somewhere in the woods, which is when I went back to the (by then) silent tower top I’d been hoping to find. 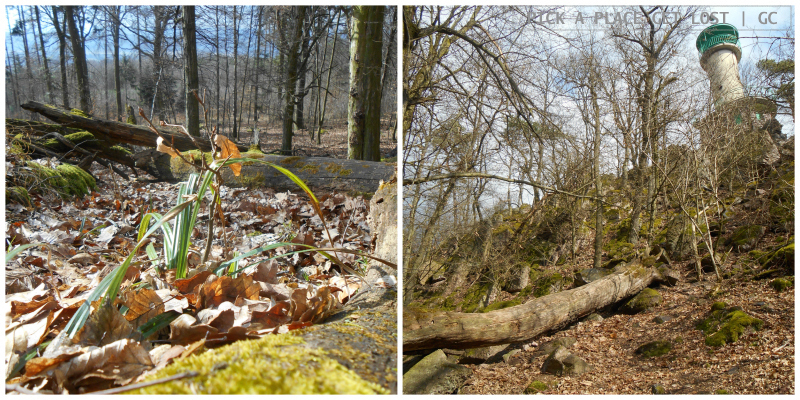 I loved how the chromatic scale of the landscape changed by the second. The greyest clouds attempted to cover up the line of the horizon, but the wind prevented them from keeping a firm grip. Then the sun peeked out, timidly at first, then elbowing its way through, as if saying: ‘Move aside, kids, I am the star here (literally and metaphorically)’. For a few minutes patches of clear sky appeared out of the blue; the meadows covering the hillsides brightened up and, as The Postal Service would have it, ‘everything looks perfect from far away’. There was this specific spot where a bunch of tall trees huddled up, their trunks perfectly aligned with each other, like soldiers standing to attention as they wait for the next order from above. I had my lunch right by the tower, and then I made to head back to Lelekovice. The trail was super smooth, and made for an extremely pleasant descent. 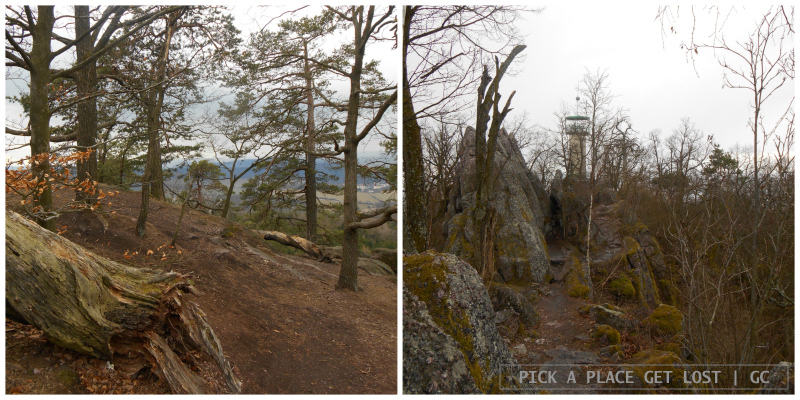 The terrain was earthy, not too steep, and marked by the occasional outlook point through the trees. I was back to the beginning of the trail in no time at all. The sun was shining fiercely, the air all springy and warm. As I sat on the bench by the bus stop, patiently and contentedly waiting for the bus, I thought to myself: I’m soo not done with Babí Lom. 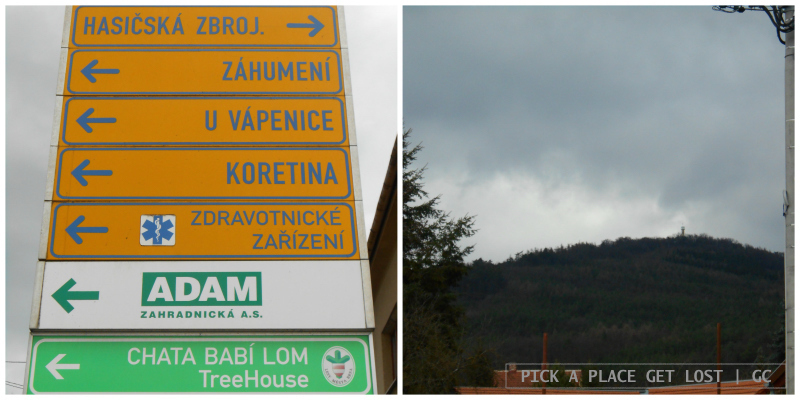 I still haven’t seen the tree house, and there’s also that ‘Švinošice’ sign at the junction near the top, which I want to check out. Plus all the other signs pinned to the tower wall: it’s good that I took a photo of them, so I can Google them later on. So when is my next day off again? 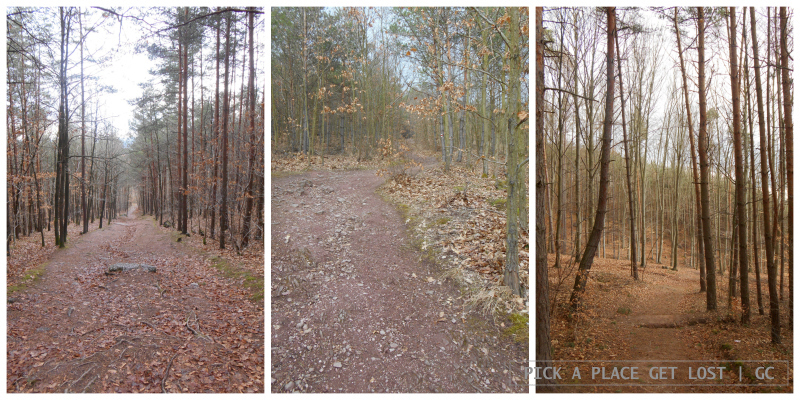 This entry was posted in Brno, Czech Republic and tagged babí lom, brno, hike, lelekovice, natural reserve, south moravia, woods by Giorgia. Bookmark the permalink.